While collecting shells along the beach was a beloved childhood pastime, Carmi never thought this would lead to anything serious. 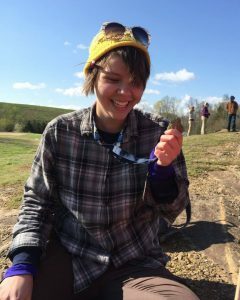 This changed after a few fast-paced weeks looking at Devonian shales in Ohio, where pyritized brachiopods got her on the path to learn more about paleontology. Most of her life has been spent in the mid-Atlantic region of the United States, in the coastal plain of Maryland and Virginia. Right now, she works as a collections assistant in the invertebrate paleontology division at the Florida Museum of Natural History but can also be found at the beach from time to time.